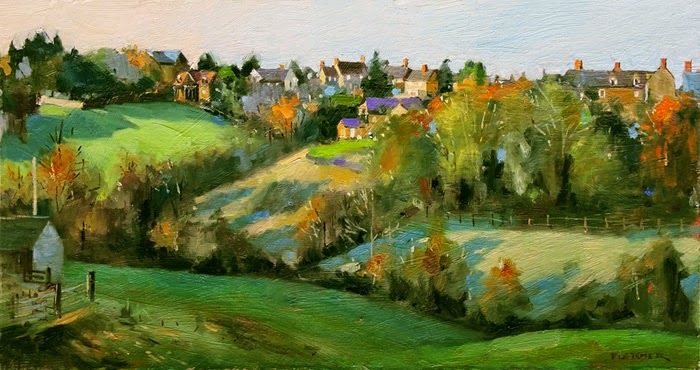 Out the door down the muddy footpath, over the style and along the edge of the valley you come to this where was able to paint until the light started to fade. 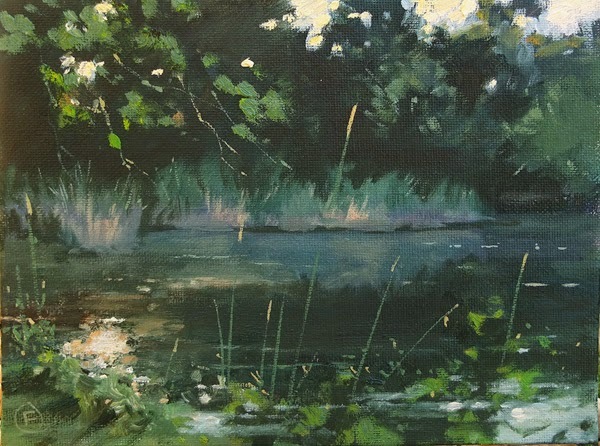 Oil on board, a larger painting - 8 x 16 inches. I was sitting outside a small cafe enjoying a coffee and listening to the musicians playing in the piazza in front of this splendid building. 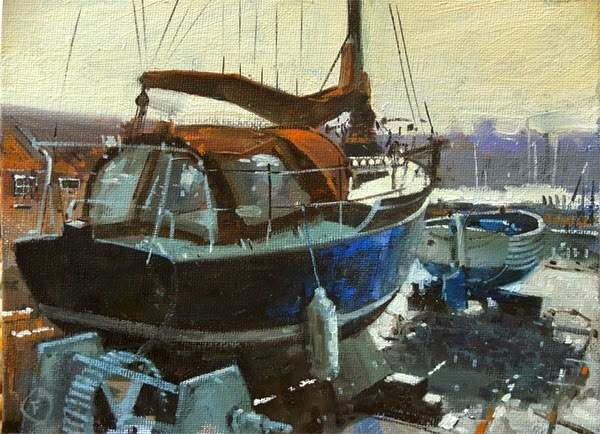 Yesterday's workshop demo which proved to be a bit of a challenge but everyone produced some good work. 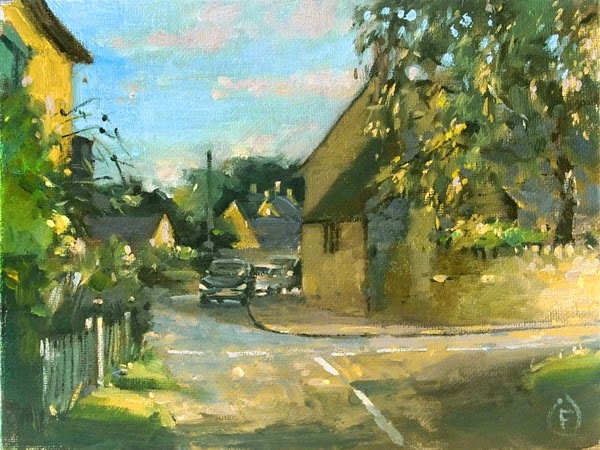 I held two workshops this week here in Sibford for oil and watercolour everyone seemed to enjoy themselves and some lovely work was produced! This is my demo from the oil class. The bridge over the Oxford canal near Somerton on a bright sunny day, looks like I'm actually standing in the canal! 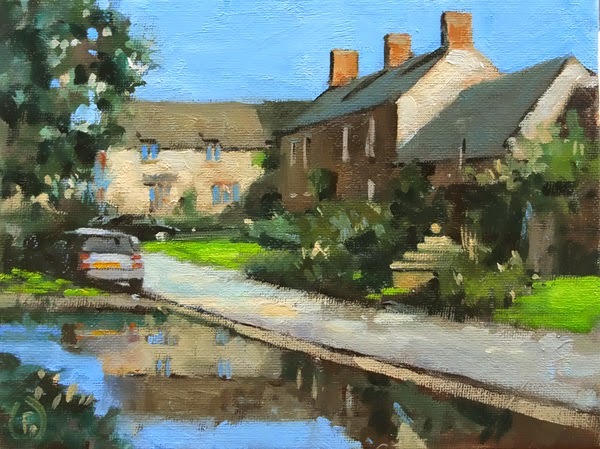 I'm quite enjoying making these little studies around and about in Sibford, today's is the bend in the road that leads into the village from Hooky which I never knew was called Rymells corner. From a pic on my laptop this boat in for repairs, is in Southwold Harbour on the East coast on a very wet day - hence the photo! 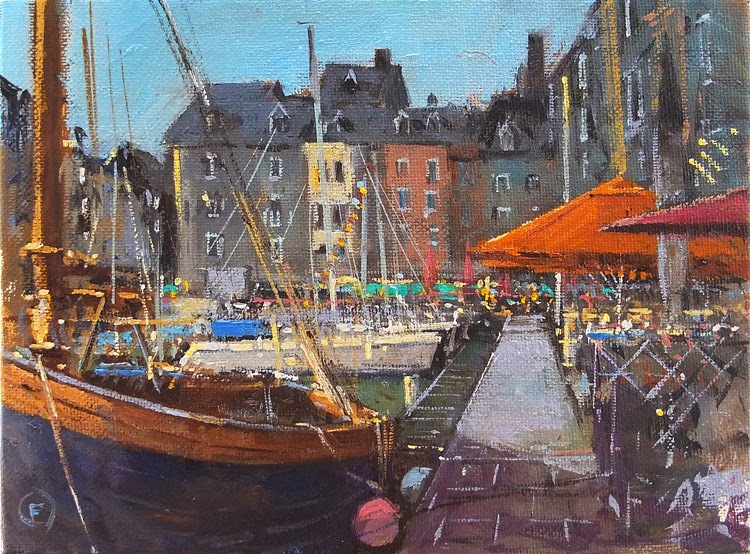 My last night was in Honfleur about an hour and half from Bayeaux and Port en Bessin, you can't help but be impressed with this gorgeous little town centred around the old harbour, at 8 am I found it difficult to settle but knew I'd have to get on with as the harbourside cafe's would soon be full of people. 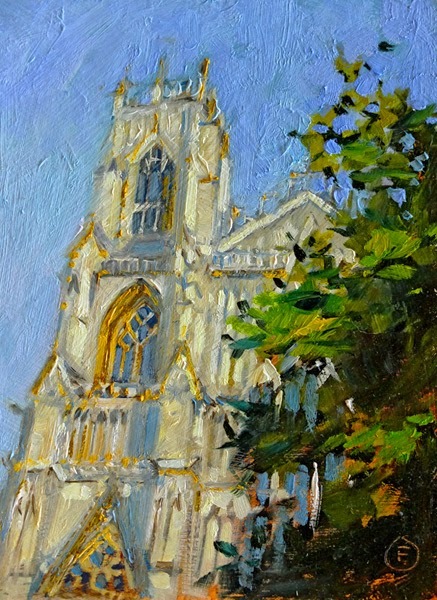 Once this was finished I had time for a quick cuppa and then off to Calais and the ferry! Click the image to see the finished painting. I am making my way back to the UK and this time taking a slight detour to visit a few places along the way. The first is Mont Saint Michel on the Normandy coast. 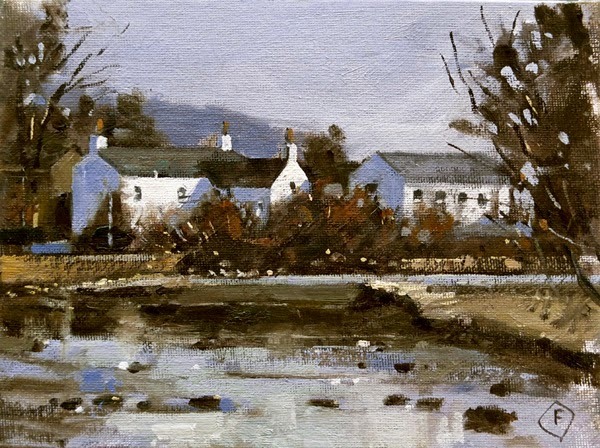 It was a dull and damp day but I was determined to get the paints out. You can see a better image of the painting by clicking here. 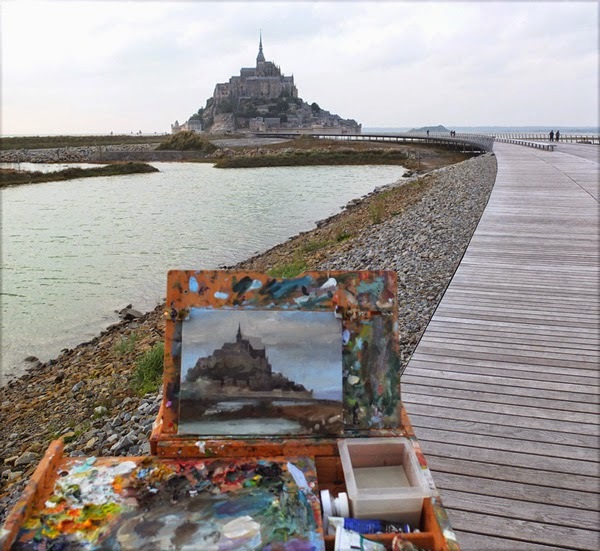 Painting at Mont Saint Michel. 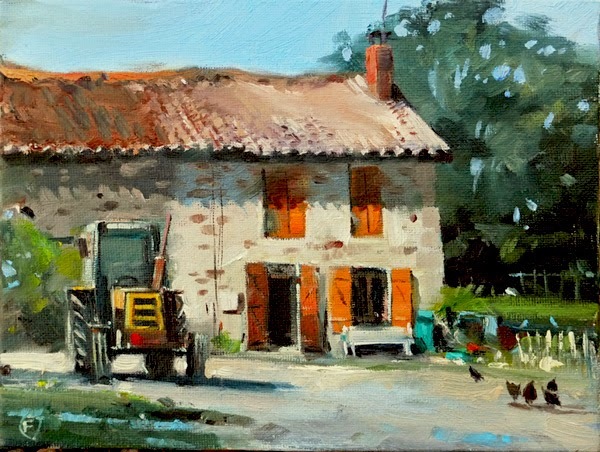 Neighbours en France, £99 each. These two little houses sit side by side in the old village, they provided a great subject for my painters from Oregon this Summer. Not lived in now but still cared for and there was a bumper harvest of grapes this year from the vine that spreads across them. I think they're gorgeous but too much of a renovation project for me, I'll just enjoy painting them. I've placed them together here and it would be a shame to part them! £99 each. Neighbours en France. 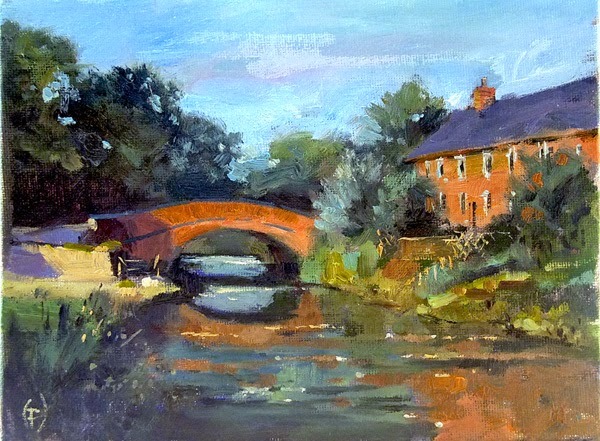 OIL, each painting is 6 x 8 inches. £99 each. 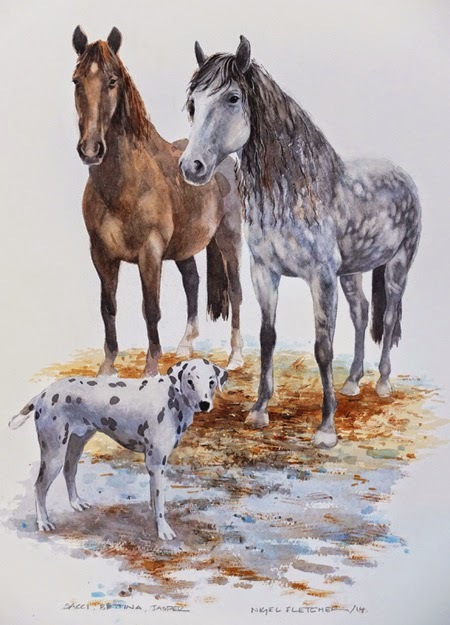 Another portrait, this one is of my neighbours' horses, they often walk past me in the mornings accompanied by Jasper the Dalmation who is usually on the lookout for any baguettes that have been left on village doorsteps by the boulanger. 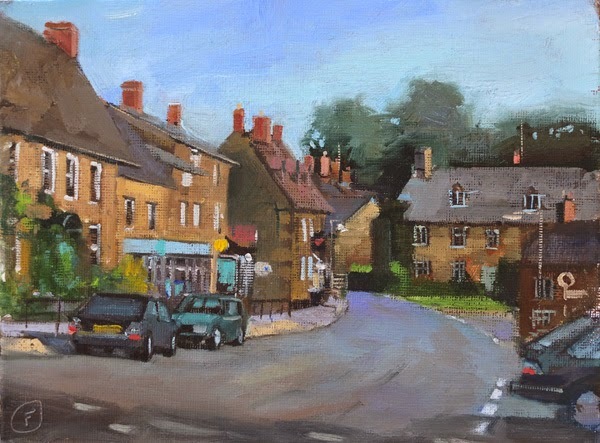 This is the main road through the village of Hook Norton or Hooky where the delicious beer comes from.